How does BlueCamroo compare to other CMSs? Selecting the right Website Development Platform (WPD) for your business can be tough, there are literally hundreds of them and you may have actually only heard of a handful of them. However deciding which one to use depends on your level of expertise and your website's goal. Do you just need a website to do basic promotion? Or do you need your website to be an integral part of your business which can help automate your marketing? Do you want the easiest platform to learn? Or do you want to get more from your website? BlueCamroo's Website Development Platform (WDP) offers a mix of an easy-to-use, easy-to-learn, and powerful business tool. Developers can build complex sites while still being more business owner friendly with its connection to BlueCamroo's Business Management System. WordPress started a simple blogging tool that has grown into a CMS solution that you can add pretty much anything to. It was designed to be easy-to-use but with that has limitations and a lot of third party connections. Joomla has always tried to toe the line between the easy-to-use WordPress and the highly technical Drupal. It does a good job but its customization capabilities are limited. Drupal is a powerful, tool designed with developers in mind, so they can build complex sites. BlueCamroo is a closed-source solution but one with powerful modules that can be added at no extra cost. All of the back end is documented and there are PDF guides to learn to use the site. BlueCamroo also offers demos for the WDP. It’s great for starters as it’s intuitive and easy to use. It’s easy to paste text from a Microsoft Word document into a WordPress site. You have access to a lot of plugins to grow your site as you see fit. If you want to create your own theme from scratch it will require a reasonable knowledge of PHP Joomla is less complex than Drupal but more complex than WordPress. It has a relatively uncomplicated installation and setup. Joomla requires plugins for certain scripts. Drupal requires technical expertise to properly use. However, it also is capable of producing advanced sites. They have been making it easier to use. If you can't commit to learning the system or can't hire someone who knows it, it will take a while to learn. The WDP comes with core features that include a CMS, Nested Templates, Pages, CSS, Forms, Customer Database, Users, and more. From those core components you will be able to add any of BlueCamroo’s Website Modules for no additional charge. 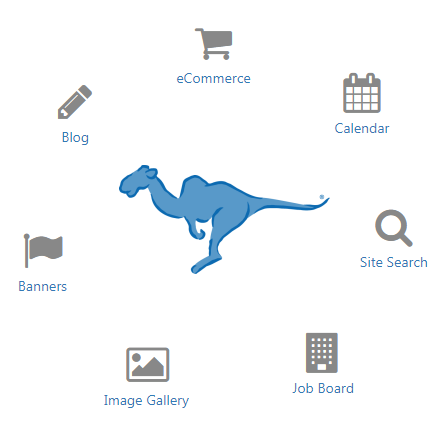 You can add eCommerce, Blog, Calendar, Image Gallery, Job Board, Site Search, and Banners. WordPress is a basic CMS that you can add features to from a robust plugin library of over 50,000 plugins. They are all built by third parties and have to be updated on a regular basis. Joomla is designed to perform as a community platform, with strong social networking features. Drupal is known for its powerful taxonomy and ability to tag, categorize, and organize complex content. The WDP is a flexible solution due it's modular design. You can use it for a simple online brochure, or you can build yourself an eCommerce store. You can also connect your websites to BlueCamroo and use their powerful CRM, Project Management and much more. Or if you’re a Digital Marketing Agency you can offer it as a product. WordPress is great for simple web sites, such as a blog or a static online brochure; and for anyone looking for an easy-to-manage site. Add-ons make it easy to expand the functionality of the site. Joomla allows you to create websites with better content and structure than WordPress offers, but still with fairly simple usage. It supports eCommerce, social networking, and more. Drupal is best for complex and versatile websites. If you have the heavy expertise and require complex data organization. The Website Development Platform (WDP) is a legacy product developed exploiting knowledge and experience that we acquired from Voloper OpenSites WDP and the VGM eCommerce platforms. OpenSites WDP and VGM have been used since 2002 to build over 12,000 websites and eCommerce stores around the globe and it still being used today. The WDP is not only a website builder, it also allows you to host, manage and connect websites to BlueCamroo’s Projects. Comparing BlueCamroo's WDP vs HubSpot's CMS is a bit different than comparing it to the other CMSs because both companies connect their websites to powerful engines that allow their users to do more than standard website builders. HubSpot is an all-in-one Inbound Marketing software that has a CMS to create online content to bolster its inbound marketing capabilities. BlueCamroo is all-in-one Business Management System that can integrate websites into its CRM, Workflow Automation Engine and much more, it's connection to BlueCamroo can turn a website into an incredibly powerful tool to help manage your business. We're going to take a look at how these two systems approach website building. The two systems have thought of a lot of the same great features. They both allow you to host your websites on their systems, they are both SEO friendly, they both integrate with analytics, they can both push content to Social Media, and a they both can connect you to their powerful systems. HubSpot allows you to create websites and landing pages with the main goal of feeding inbound marketing. With that as their main goal they can be very limited in functionality extending past marketing. You will be able to build fully responsive websites and landing pages but not eCommerce stores. With BlueCamroo's WDP you can create unlimited, stunning websites, landing pages or eCommerce websites. You can also optimize them to look great on any mobile device. You can also add BlueCamroo's modules to your website at no additional costs to enhance the functionality of your website. Anything from creating a blog, to promoting available jobs in your company. HubSpot allows you to connect to their website to their inbound marketing engine. BlueCamroo allows you to connect to its system as we as integrating your website and your BlueCamroo system with HubSpot. HubSpot is mainly concerned with marketing but BlueCamroo can connect it to several aspects of running your business, including marketing. What Does BlueCamroo's WDP Offer? Build as many sites as you want without additional charges. Easy-to-use site-builder. You can customize your design and content for different types of devices easily. Start building your own database of prospects and clients to maximize your marketing and profitability. You will be able to add valuable modules at no extra cost, and more secure than open source options. Build your websites and give people the amount of access they need and nothing more. WDP websites can be connected to BlueCamroo's system, take advantage of their CRM, Project Management, Invoicing, Support Ticketing tools and so much more. "I have been working with Voloper and BlueCamroo for over 10 years and I hope to continue working with them for many more. I know when I build websites for my clients they are reliable and secure. I have built dozens of these websites because their versatility allows me to build custom solutions for different sized clients. From simple online brochures to sophisticated eCommerce websites, I have built them all and have had fantastic secure hosting as well. Anytime I've needed help from support I have gotten quick responses. And they have been helping us migrate sites and update them with modern designs. All of my websites are very easy to work with for SEO and my digital marketing practices, and they're all performing well."